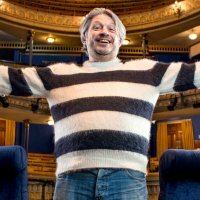 Joining the ever increasing list of comedians planning well in advance, is Richard Herring, one half of Lee and Herring who you may remember from "Fist of Fun" and "This Morning With Richard not Judy". He's been hitting the circuit for twenty years, with or without his partner-in-laughs, and the next 12 months or so promise to be pretty intense to say the least. He plays a near sold-out gig tonight (22nd) at the Riverside Studios in Hammersmith, but from then on it's Edinburgh all the way with a preview in Stoke Newington (29th), Scarborough's Open Air shindig (30th) and the excellent looking Greenwich Comedy Festival on 8th September. During these slots he will present his "Christ On A Bike" show, an evening that ponders just how cool Jesus was ('a bit like the Fonz') - a far cry from his role as Hitler a few years back. Tickets are available for all these appearances - the White Hart gig is only £5 and also stars Nat Luurtsema who's also dead funny and the creator of the show "Superclump" in 2009. His Edinburgh shows will be a mixture of other solo works including "As It Occurs To Me" (17th Aug - Assembly Rooms) and a live podcast with writer Andrew Collins (under the banner "Collings and Herrin"(sic)). But its his new shows of interest here - he has announced a welter of 2011 dates that begin in March in Wolverhampton on the 5th and continue to York (6th), Leeds (8th) and Preston (28th) - these are now on sale, priced at £17.50 plus fees. Expect some new material and maybe even some bits from his recently published book of memoirs "How Not To Grow Up". Not surprisingly, Stewart Lee is also doing the rounds, including various nights in October including a residency at the Leicester Square Theatre from 26th Oct to 18th Dec - tickets cost £18.50 plus fees.